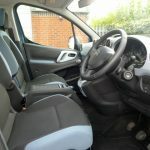 A Berlingo with 4 seats and a 1.6 cc diesel engine and manual gearbox. 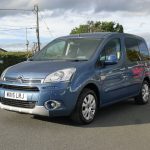 Plenty of power to get around in and a great compact wheelchair accessible vehicle that simply ticks all the boxes. 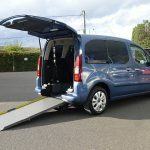 The converter is G M Coachworks and this vehicle has been adapted with a lowered floor and a two piece ramp providing a gradual incline into the back where the wheelchair sits. 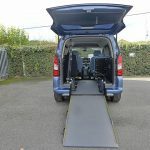 The 4 point wheelchair restraints and safety belt system is designed to ensure that the wheelchair user is always fastened in securely before setting off on any journeys (take a look at the demonstration video in the ‘Advice’ section above). 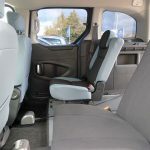 The rear seats are very useful to have providing extra seating for any additional passengers, or some people chose to use the seats to place any essential items required by the wheelchair user. 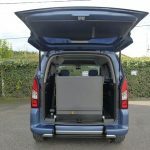 If additional space is required for the wheelchair to fit in, then the rear seat behind the drivers seat can be folded out of the way creating more room – very clever indeed. 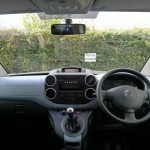 There is an overhead shelf in the front that is ideal for placing any items out of view and useful for keeping the vehicle nice and tidy when on the move. 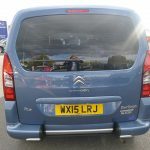 If privacy is required by the wheelchair user then this car has rear blackout windows which, of course, also prevent any glare caused by bright sunlight – a preference for some people. 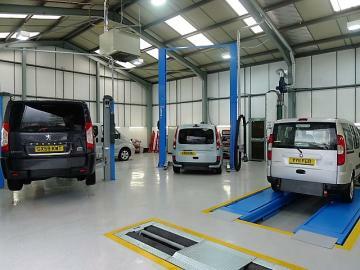 Air conditioning is also included and useful to have on those warmer days and longer journeys. 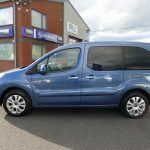 These types of vehicles provide an excellent means of escaping the indoors and provide the wheelchair user with the freedom and enjoyment of getting out and about. 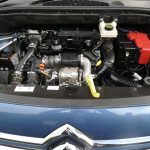 If you are new to this type of car then please take a peak in the ‘Advice’ section above. 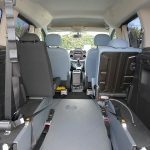 It is full of very useful information and guidance on the options available to help you find that perfect WAV for your particular needs. You can, of course, just give us a call and speak to one of our experts who will provide you with all the support/assistance you need. 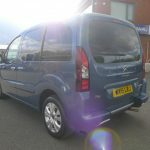 All of our wheelchair accessible vehicles come with 12 months MOT, 12 months warranty and are serviced and valeted in our very own state-of-the-art Service Department.